1. In a small bowl, combine all of the ingredients for the dressing and mix well. Heat a small skillet over medium heat and gently toast the pecans, about 3 to 5 minutes. 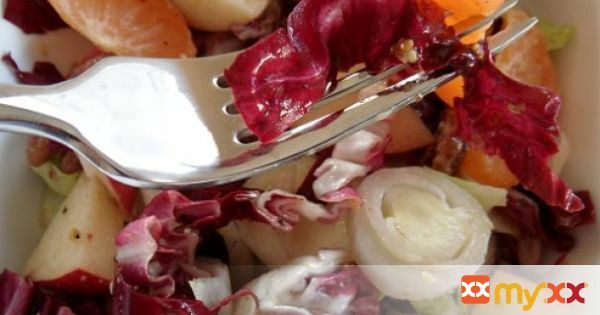 Chop the endives, radicchio and apple and place in a large serving or mixing bowl. 2. Peel the mandarins, section them out and put them and the pecans with the other ingredients . 3. Drizzle desired amount of dressing over all ingredients and toss until salad has a thin coat of dressing over it. I like my salads to have a strong dressing flavor, so if you are the same way, use all of the dressing from the above recipe – if you like the flavor to be more subtle, use half and then test out the salad before adding more. 4. Allow salad to sit in the refrigerator at least 30 minutes before serving so that the vinegar (and other liquids) soften the endive and radicchio leaves a little and break down some of the bitter taste.